Welcome to White's Nautical Antiques, your only stop for high quality antiques, located in North Yarmouth, Maine. Our model boats, sea-inspired art, ships in bottles and other marine antiques are perfect for the collector, or as a gift for the nautical enthusiast in your life. 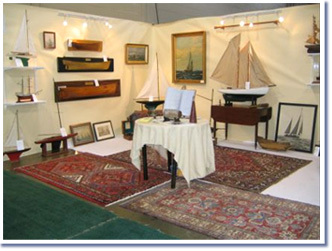 Our constantly updated inventory includes Pond Sail Boats, Antique Ship Models, Ships in Bottles, Sea Dioramas, Nautical Art, Half Hulls, Clocks & Brass and a variety of Miscellaneous Antiques. We also have a history of our antique store with a dash of maritime history.